The gear ratios provided in the ratchet contains 72 teeth providing very less angle return and helps working comfortably at confined spaces. All the Ratchets made are Hot forged and serviceable. 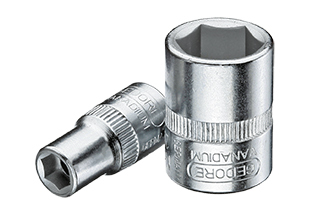 We provide ranges from 1/4” to 2.1/2” Impact sockets. Sockets are made up of Chrome Vanadium Steel. Gedore provides the torque chart for each and every sockets which it can withstand. For Torque Chart please click here.